I had a friend over for breakfast the other day. It was such a nice break! She came and we chatted for a couple of hours. My kids were all at school, her preschooler took advantage of a kids' house with no kids in it (meaning she had full control and never had to wait her turn. Bliss). It was such a wonderful escape from the constant running around that I have done for the past few weeks. Anyway, I did what I consider to be typical for myself, and I waited way too long to reciprocate the favor. So long that I started to feel so much pressure. Waiting that long could only mean two things. Either I am too lazy and distracted to invite her for breakfast (and I don't really want to admit that), or I am planning something really really special. So that means I totally had to come up with something good, right? But she already set the bar so high! I mean, fresh chocolate scones? How do I top that? And I don't even own a juicer! (hint, hint). Plus, her house was spotless. How do I compete with perfection? Okay, I'm exaggerating. This is the coolest, most laid-back friend. She totally would never expect that she should be invited back, or that anything should be special in any way. I could invite her over for a bowl of Cheerios and she would probably be just fine with that. Still, though, I did want to make a yummy breakfast. I never eat a good breakfast. Most days I get the kids fed and ready for school and then whip up a quick protein shake to down on my way to work. Not exactly leisurely or inspired. Having a friend over forced me to actually think about what I was eating for a change. 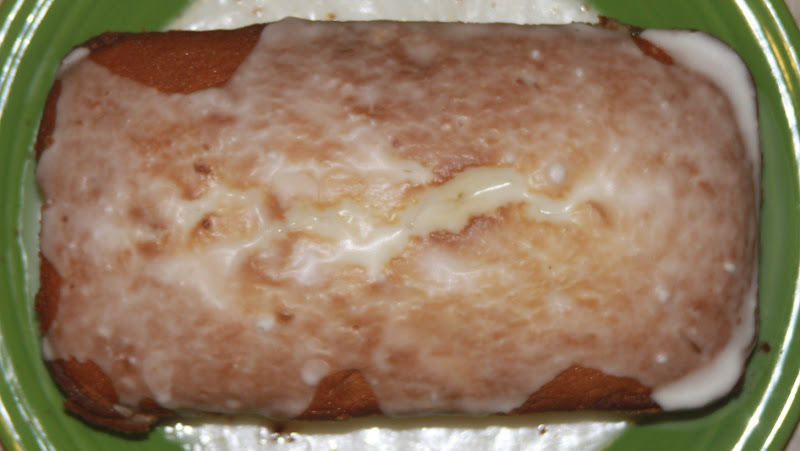 Lo and behold, this week's Abundant Harvest newsletter included a recipe for Lemon Cake. Either the food gods are looking out for me, by continually setting perfect recipes in my lap at just the moment I need them, ... or I'm getting lazy and cooking the first recipe I see. Let's go with I am in the gods' favor. It makes me feel special. One of the great things about this cake recipe is that it makes two loaf-sized cakes. That means that we had one with our breakfast (and the kids had the leftovers for an after-school snack) and I sent the other in to my son's teachers as a little recess-time snack, to thank them for their hard work at the school fundraiser the day before. Win-win-win! Everyone's happy! The cake is really nice. It is lemony without being overwhelming. It's almost like a pound cake with some lemon added to it. 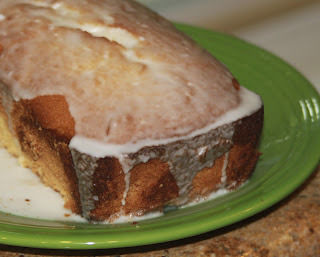 The recipe called to make a syrup that would soak into the cake, (and I'm sure up the lemon-factor). Instead, I thought it would look nicer and taste just as good to make it into a glaze that stayed on top of the cake. By slightly decreasing the amount of lemon juice and using powdered sugar instead of granulated, I thought it made a nice difference. This one travels well and goes great with a cup of coffee. Take some to work to share in the staff kitchen! In a stand mixer, beat butter and sugar until light and fluffy. With mixer on medium speed, add eggs and lemon zest. Add dry ingredients. In a small bowl, combine l/4 cup lemon juice, buttermilk, and vanilla. Add the lemon mixture to the mixer and mix thoroughly. Divide the batter evenly between the two pans. Bake for 45 minutes to 1 hour, until is is turning golden and a toothpick inserted in the middle comes out clean. When the cakes are cool, remove from their pans. Combine the powdered sugar and the remaining lemon juice (a tiny bit of juice at a time, until the glaze is a good consistency). Pour the glaze over the cakes and serve.